Canvas is a HTML tag for an interactive drawing surface. Its use is very simple. The HTML 5 doctype to the page. to avoid it changing the document mode when it can not validate it. An id est required to access the tag. Canvas is not implemented in this browser. The script will be started by the onload event associated with <body> or window element. The fillStyle attribute assigns a color to the current context, which will be used by all drawn objects thereafter. We can assign a color name, a rgb or rgba code. The fillRect method shows a rectangle filled with the current color, and for parameters: x, y, width, height. Nothing is displayed in Internet Explorer 8 and older versions which do not recognize the canvas tag. 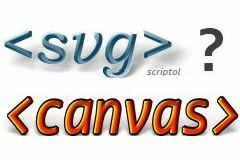 Canvas 2D Context. W3C spec.